Smash Up is a quick, easy-to-learn “shufflebuilding” game by Paul Peterson and published by Alderac Entertainment Group. As with all of my analyses, I am assuming you know the rules to this game so I can focus entirely on strategies. I am also considering only the base version, although the expansion factions are pretty sweet. Smash Up is a fun one where a little strategy preparation can go a long way and once you master the basics, you can compete against the best Smash Up players in the galaxy! Check out the video version of my analysis above or the text version below. I really like that this game is still fairly simple, as I’m sure Mr. Peterson was very tempted at times to add additional phases to more clearly define when certain actions can be taken. I’m glad he kept it simple, and he was also able to do it without creating many instances of players not knowing when their actions can be performed. Many card games, such as Magic: The Gathering, can sometimes overwhelm the players with trying to keep up with special rules for each of the many phases. I’m super glad they simplified it by not having any kind of casting cost for each card as well. The key to doing well in Smash Up is picking races that complement one another and then executing each faction’s strategy as efficiently as possible. A player will not be successful in having a general Smash Up strategy that they use no matter which factions they have… they really need to play differently for each combination. I will go through each faction, how to use them, which other faction to pair up with them, the bases they prefer, and which are best to use as a counter-faction to those chosen by your opponents. The faction combinations are not balanced. 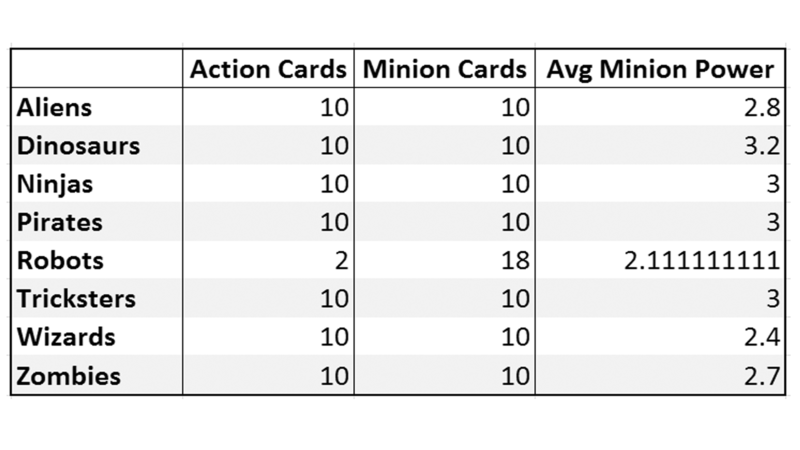 Here is a table of each faction along with the count of minions, and their average power, and actions. Of course this does not take into account cards or abilities that increase their power or resurrect dead minions. So for example, the Dinosaur’s War Raptor is a power 2 minion that gets +1 for each War Raptor on the base, including themselves, so for the Average Minion Power calculation, they are considered a 2 power, even though they will have at least a 3 power after counting War Raptors, assuming other players are not negating its ability. I absolutely love how the faction strategies make perfect sense with their names, like the aliens probing and scouting or the pirates sailing between bases and blowing things to pieces. Gamers who really get into the theme of the game will have a lot of fun roleplaying their factions. It’s better to take factions that will allow you to control when/how bases will score, usually with big minion power numbers, rather than on controlling the game via control/destruction cards. Killing minions/actions may force a player to take a lower scoring amount when a base is scored, and/or delays when a base will be scored, but it doesn’t guarantee that you get additional VPs. But if you can get 10+ power onto a base on one of your turns, this will often be enough to score it and you will know/affect who gets which place when it is scored. But even if you don’t get a top-tier combo, any faction combo can win this game as long as you use its strengths to your advantage. Aliens are based around sending cards back to players’ hands, either opposing minions or their own. Their “sending back” skillz give them flexibility to get rid of cards that are doing the most damage to their plans, but the downside is that those players can bring those cards back out next turn. Their best card is the Invader minion that just gets a straight 1 VP for being born and their primary strategy is to get that guy out, then send it back to their hand, then play it again during their next turn to keep racking up the VPs one by one. They usually will not get first place when a base is scored, but can make up for it with free VPs from the Invader. When they win, they will win by a small margin, but they are a viable faction. They will almost certainly lose if they get unlucky with shuffling and their two Invaders are at the bottom of their deck. The Mothership is one of their favorite bases so they can send that Invader back to their hand when the base is scored. Aliens can do fairly well against Zombies because they can send their minions back to their hand instead of killing them where they go into their discard pile and can be resurrected easily. They are also good as a partner to Zombies because that Invader can be brought back from the graveyard after it dies. Pairing them with Wizards is usually pretty good too because you effectively guarantee that you will get to the two Invaders at least once throughout the game. Dinosaurs are simply big and dumb, but that’s not a dig at their competence. The Average Minion Power in the table above for Dinosaurs of 3.2 is deceiving because it is calculated from the base value, but many of the actions and minion abilities for these guys revolve around increasing the power of minions, so these guys are actually head and shoulders above the rest in terms of minion power. Their primary strategy is just to pick a base, pile on their abundantly available 3-5 power minions, and take first or second place on every base score. It’s a great feeling when King Rex hits the table because his base 7 power will tear down almost any base on which he lands. Base abilities are not particularly useful to a dinosaur player, but their favorite is probably Factory 436-1337 to get 1 VP for every 5 power they have on it. This is a good faction for a new player because you do not have many minion micro-management decisions to make throughout the game – you just decide where to put your dudes and when to boost their power with actions. Ninjas are a mysterious faction… you never know what a Ninja player might do during base scoring. This is a “control” faction as they can destroy minions, destroy actions, and modify the minions on a base as it is scored. Their primary strategy is to drop down Ninja Acolyte to get some 2 power minions on bases to use during base scoring on opponents’ turns, but then on their turn, they can switch that 2 power minion with a larger power minion to hopefully score the base on the Ninja player’s turn. They also need to timely use their “before a base scores” special abilities to drop down extra minions during base scoring. The bases ninja players like are the ones that give decent abilities during scoring to the non-winning players, like Tortuga or The Grey Opal, because they usually don’t win bases but can easily come in second with their sneaky pre-base-scoring abilities. The downside for the Ninjas is that they are a control faction that cannot hope to control more than one player, making this a good 2 player faction, but one that has diminishing returns in games with a larger number of players. When choosing factions, they can try to pair up with another control faction, such as Aliens or Tricksters, or one with some good minions to replace their Acolytes with, such as Dinosaurs. These blokes excel at moving minions between bases in their boats and blowingthings up with their cannons. The four First Mates can stick around for the whole game by skipping over to another base after their base is scored. Pirate players can also move minions around between bases at any time with action cards, which can be helpful but you usually have better things to do with your actions, such as fire those cannons. They will rip apart factions with a lot of smaller minions because the Pirates have 7 cards, out of their 20, which destroy minions of power 2 or less. As the Pirates, a wise player does not worry about saving these direct-damage cards for just the right time because they know there will be many more in their future. Pirates can often take advantage of base abilities because they can so easily move their minions to and from bases. For example, before Factory 436-1337 scores, they can move their Pirate King and/or other pirates over to it to grab at least one free VP because that gives 1 VP for each 5 power worth of minions on it. Obviously, Pirates are ruthless against factions with a bunch of smaller power minions, like Robots and the almighty Zombies. The other players will rely heavily upon the Pirates to keep these two super factions in check. You usually do not want to pair these guys with another creature-removing faction, such as Ninjas, but they will be a fine partner to any others. Robots overwhelm with numbers, as they are the only faction that does not have 10 action cards and 10 minion cards, in fact they have TWO actions and EIGHTEEN minions. The minions are all fairly small, but they come out quickly and give each other bonuses for more numbers. Their ability to play extra minions in a turn is their true strength because, when it comes down to it, minions score bases and scoring bases gets you points. More minions on bases means more points, especially when those wimpy 1 or 2 power guys start getting bonuses from other robots. The order in which you draw robots is very important and determine whether you dominate a game with them or your robots get stuck in neutral. The Microbot Alpha and two Microbot Fixers are the keys to scoring a base because they turn little bots into big bots, but will greatly diminish your effectiveness if you do not draw them or they are destroyed by opposing players. Another draw order dependency is the restriction of Microbot Reclaimer and Microbot Fixer, that they must be the first minion played this turn to activate their ability, which can get annoying if you do not have them in your hand when it’s time to play a minion. One usually wants to do any card drawing they can using actions first if they do not have one of those two minions, so they give themselves a chance of drawing one. Robot players should flock to bases such as Rhodes Plaza Mall or The Homeworld or The Central Brain to take advantage of their high number of minions that they can pile up on them. The Grey Opal is great too because they can save one of their super minions to another base instead of sending them to their discard pile. A great partner faction to Robots is the Wizard faction because the they can draw more cards and take extra actions to allow a player to throw down an army of robots in a single turn, although Wizards do water down the probability you will draw a minion for your three Hoverbots (who allow you to draw a card and put it on a base if it’s a minion) and it takes away from the Wizards’ four Neophytes (who allow you to draw a card and/or play it if it is an action). Tricksters are also tempting because they have ways to play more minions and get minion-count bonuses too. Tricksters are another control faction who can destroy creatures and actions and force players to discard cards. The Tricksters do not have a clear winning strategy, so they are more of a support role for their partner faction. They can destroy minions or actions and force players to discard a lot of random cards, which is great if you can luckily make them destroy some of opponents’ super cards, but won’t be enough to keep their hands completely tied. Like the other control factions, the Tricksters can restrain a single opponent in a two player game, but will find their tricks do not extend to larger player games very well. Tricksters, like Robots and Zombies, can do well on bases such as The Homeworld or Rhodes Plaza Mall or The Central Brain to take advantage of their large number of minions they can gather on them. They are good against Pirates because the only minions Pirates can kill with all their “kill minions with power 2 or less cards” are the Gremlins, who will then force them to discard random cards from their hand. As for their partner faction, they are well-paired with Robots because they have some minion count bonuses, plus they have two Enshrouding Mists, which is played on a base and allows extra minions to be played there, that can combo with the Robots’ extra minion-playing and card drawing. The only issue with that partnership is that you will probably run out of minions midway through the game. Wizards are all about drawing cards and taking extra actions. This is another faction that relies on its partner faction to get the base scoring VPs. It will allow a player to burn through their draw deck with drawing cards and get a lot of stuff out in one turn. The problem is often that they do not have enough minions to win bases and occasionally go through slumps where they can’t do much of anything on a turn. There are a lot of decisions to be made with Wizards about when to use each card to maximize efficiency, so I would definitely not recommend this faction for a new player or one who would not enjoy constantly deciding between a multitude of options. Wizards prefer bases like Temple of Goju or Tar Pits that allow them to put minions here back on the bottom of their deck because they go through their deck so quickly and will get to those usually powerful minions again. Pairing them with Robots is a good choice to get some incredible chains of minion-summoning while drawing lots of extra cards to keep your hand full of reinforcements. Wizards require a partner faction that can score points on bases, such as Dinosaurs, Robots, or less-so, Pirates and Aliens. Stay away from partnering them with control factions like Ninjas and Tricksters because you just won’t get enough VPs from base scoring. Zombies sort of extend the player’s hand into their discard pile by being able to get discarded cards back and play minions directly from the discard pile. The Zombies are, without question, the best faction. Zombies who die come right back onto bases, and once they get going, it’s not rare to play 10+ power worth of zombies onto a base in a single turn… or pretty much every turn. If a base is anywhere near scoring, they can usually put the number over the top and take first or second place VPs from it. Zombies are just so focused on that single strategy that they become extremely proficient at it and eventually take over the game. As if they needed another benefit, they are consistent and flexible because they do not have strict requirements on drawing cards in a specific order to be effective and they don’t have any keystone cards that, when destroyed, will severely hinder them because they will just bring them back from their discard pile. Zombie players usually want to pile minions on a single base and get it scored ASAP so that those minions head straight to the discard pile and can be played again rather than spreading them out among all the bases on the board, especially on something like Evans City Cemetery, which allows the winner to discard his/her hand and draw five cards. Of course they love Rhodes Plaza Mall too. Pairing them with Wizards or Robots are usually best, if possible, to supplement the grave robbing by adding more cards to discard piles, particularly minion cards, and providing more ways to play additional minions. If you get a paring with either of those two, you will almost certainly win the game. 15 points comes up QUICKLY. Every VP is super important. Also, teaming up on the player who is winning or has Zombies is important too. Once you get up to 10 or so VPs, plan out your final turns and sources of VPs that are available to get you to 15. So if you need 4 more VP, you can either try to focus all of your attention and effort on getting first place on a single base or you could spread out between two bases hoping for second place on each. This obviously depends on which factions you are using, which cards are in play, and which cards you have in your hand. A smart player will also be aware of each opponent’s faction weaknesses, the cards opponents rely heavily upon, current ongoing abilities, and base abilities. Obviously, take advantage of opponent weaknesses, such as destroying Microbot Alphas and Fixers to handicap a robot player or taking out a ninja player’s Acolytes before they turn into something more dominating. There are many combos in this game of which you can take advantage, like using the Mushroom Kingdom base to pull a War Raptor over to it to separate it from another War Raptor on that base, reducing the power of each or a pirate player putting a bunch of low power minions on Cave of Shinies, and then destroying his/her own minions with Broadside to pick up 1 VP for each one destroyed. Analysis paralysis can make wait times a bit monotonous sometimes, especially when a new player has to read a somewhat lengthy block of text on a card, but even the longest games are pretty quick when compared to most tabletop games and games between veterans will take 5-10 minutes. But overall, this is a game that is extremely fast to play, setup, and teach, so it is an awesome one to have in your collection. There is a bit of a learning curve so a new player won’t beat a veteran, but once everyone has played a few games, the playing field is very quickly leveled. This is kind of inaccurate because the best decks to put together are the tricksters and aliens because aliens send minions to the hand and tricksters make your opponent discard them. Another killer combo would be Aliens and Zombies. With the Zombies’ ability to bring cards back from the discard pile, you can continue to play Invaders (+1 VP just for being played) over and over again if taking them back to your hand isn’t an option. Zombies are killer. Personally I never liked pirates. Zombie robots and zombie dinosaurs are devastating. Also, robot horses and zombie princesses. The kitty cat deck seems lame to me tho. Kitty cats can steam roll if you can learn the potential of their mind control abilities. I played kitty horses and won out right by more than 5 vp. This game has some insane strategic potential and honestly the best advice is to predict opponent plays in order to setup the hand you currently have the best you can to respond. Winning is highly dependant on timing that big play, that game changer, when a table full of veterans sits down to duke it out. Unlocking unforseen strategies with factions that don’t seem to pair can be a hell of a lot of fun. Everyone loves Zombies. But I think Cyborg Apes are one of the most powered factions. Combine it with a faction to compliment it, like Wizards or Steampunk, and you can break a base every 2-3 turns. I also like to try and find winning strategies with the less powerful factions. Some of my favorites are Vampire Pirates (Vampirates), Kitty Cat Pirates (adorable! ), Innsmouth Halflings, Killer Plants & Giant Ants, and Geek Elder Things. Admittedly, I haven’t found any game breaking combo for Ghosts or Werewolves, 2 of the weakest in my opinion. But I am very proud of finding the Innsmouth Halflings. The Halflings have actions that can play The Locals without using their ability and Innsmouth has several actions specifically for Minions of power 2 or less. Broke 2 bases at once, winning both with this deck.